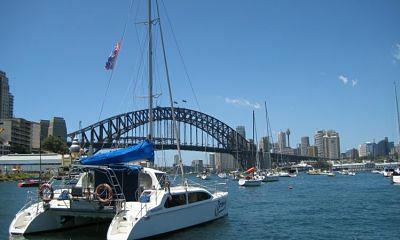 Catamaran cruising has been a hugely popular trend over the past several years. One reason is because cats provide far more stability and spacious living room than a conventional monohull. They are all about comfort, while monohulls are more for serious sailing and racing. Some purists contend that cats do not convey the “rail in the water” feel and compare cat sailing to “driving a living room.” If considering a catamaran for charter, you should take time well before embarking to learn about a cat’s unique sailing characteristics. Particularly for extended cruises, it is important to understand cat characteristics and the differences between monohull and cat sailing, which is a critical part of keeping the crew and passengers safe while underway. This article presents basic differences between catamaran and monohull sailing and some points that can assist boaters unfamiliar with cat sailing to look like pros when underway. 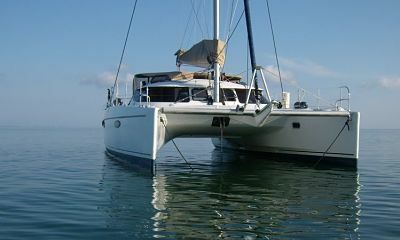 A catamaran is a vessel comprised of two parallel hulls joined together with cabin space between the hulls. They come in both sail and power versions. The word comes from Indian and Sri Lankan words for “to tie” and “wood.” For centuries, seafaring Polynesians and other South Pacific peoples have sailed the Pacific Ocean in small catamaran-type boats and their close relative, the outrigger canoe, which are famous for their stability. Commercial firms and many of the world’s navies now operate power cats as fast ferries, cargo carriers, and shallow-draft combat ships because of their speed, stability, and shallow water operability. A cat’s large, wide decks provide a real sense of space, with netting (called the trampoline) stretched between the foredeck hulls. A catamaran’s cockpit typically spans both hulls at the stern, allowing ample room for helming and lounging. The helm may be located above or in front of the main cabin for better visibility and sail control. Cats do not have the same “wheel feel” as on monohulls because the rudders are typically situated away from helm. Below deck, berths and heads are usually located in the corners of each hull, affording plenty of privacy. A salon and galley are typically positioned amidships. A catamaran derives its excellent stability from its wide beam instead of a ballasted keel, which makes dining, sleeping, and living aboard far more comfortable. A cat’s lighter weight and shallow draft result in faster speeds, typically 25-30 percent more than a cruising monohull of similar length. Most cats carry twin engines, providing excellent control in maneuvering and docking. Cats typically draw only 2 to 4 feet of water, and can anchor in places monohulls cannot, like close to beaches. Underway, the most noticeable difference between a catamaran and a monohull is the lack of heeling, making for a very comfortable and safe sail. A cat rarely heels more than 5 to 10 degrees, contrasted with 20 to 45 degrees of heel on a conventional sailboat with a ballasted keel. Reduced heeling greatly increases the margin of crew safety during sail changes, reefing, anchoring, and in heavy weather when crews are out on deck. More level sailing on a cat reduces the potential for a Man Overboard situation, compared to a monohull. Catamarans and monohulls use the same basic techniques when under sail, but there are differences. Because pressure on the sails quadruples as wind speed doubles, cat crews must be vigilant about reefing the sails to keep the boat in trim. During a tacking maneuver, it is often necessary to use the jib to “back” the cat around. On a monohull, the mainsail does most of the tacking work. Depending on cat layout, mainsail and jib sheet controls (winches, cleats, cams, etc.) may be located in areas other than the cockpit, like on boats with helm stations above or in front of the main cabin. This can present a challenge for crews during sail changes, reefing, or anchoring. Catamarans with low bridge deck clearance (the distance from the water to the bottom of the boat) are prone to pounding and slapping in confused seas or cross-swells. Cats have more speed off the wind, but do not sail as well upwind as a monohull. Often, it is easier to fire up the engines on an upwind course than to use the sails. Typically, cats pay more for docking fees because their beam is too wide for regular-sized slips. In close-quarters maneuvering, visibility on cats is limited, so the captain needs an effective means to communicate helm/sail changes and anchoring orders to the crew, usually by using hand signals to transmit orders. Since cat heeling is reduced, most wind power is converted to the sails, so cat sailors must pay constant attention to sail trim and the helm in gusts. Because catamarans are so light, maintaining momentum can be an issue, especially in light winds, because the wind is the only source of forward motion. Monohulls can pitch pole, or completely roll and still return to an upright position. After capsizing, a cat will usually remain capsized, but it is a relatively stable platform while waiting to be rescued. Monohulls would be more likely to sink. Stowage for a cat’s anchor/rode is typically between the hulls and away from the anchoring point, so setting or weighing anchor can take extra time and require working on deck in sloppy weather, which can be dangerous. Stability, loads of space, level sailing, and overall comfort make catamarans an excellent choice for day sails or extended cruises. Boaters considering a catamaran should take time well before departing to learn about a cat’s unique sailing and handling characteristics, both while underway and when docking. Understanding the differences between monohull and cat sailing can keep the crew and passengers safe while underway and enhance the sailing experience.